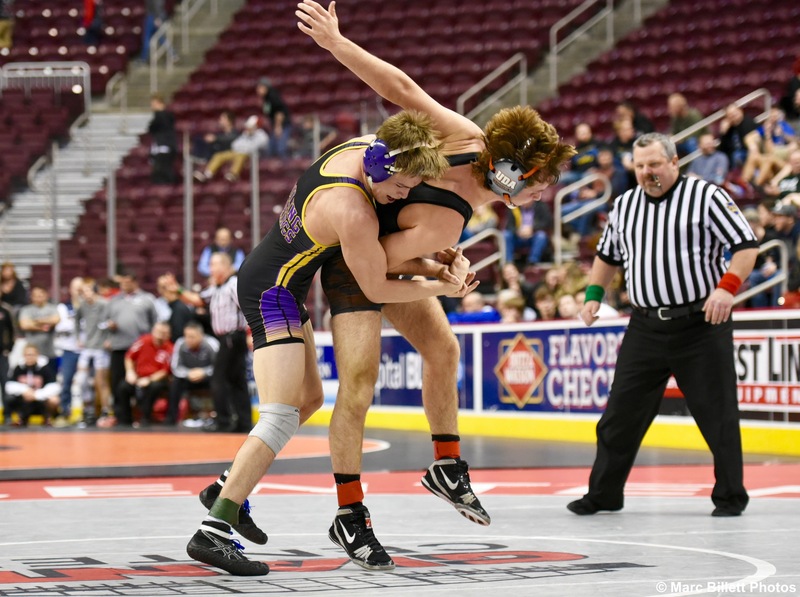 HERSHEY: Boiling Springs’ Collin Nestor didn’t need any manufactured motivation or coach-speak before his District 3-AA Championship quarterfinal round. Across the mat was Upper Dauphin hammer Bronson Garber. Not only was the Trojans ace No. 2 in the state, according to PA Power Wrestling, Nestor lost by a point the last time these two wrestlers met. The nature of that loss stung a bit. Garber received two points via a shoelace infraction and locked hands, and Nestor wanted revenge. This time, there were no freebies. Nestor, ranked 23rd in the state hit a takedown in the last minute to down Garber 4-3 and advance to Friday’s semifinal round. “I feel pretty good,” Nestor said. “Last time we wrestled, things didn’t go my way because of stupid calls. I had to go out there and give it my all. So, I went out there, did what I did, and came out on top. Garber came out strong in the 126-pound quarter with a takedown, but Nestor escaped in short order to keep it close at the end of one period. Nestor chose bottom in the second and evened the match with a quick escape to make it 2-2. In the third, Garber, who entered the match 35-0, escaped, but Nestor kept up the pressure and intensity. He executed an outside single and took the Trojans standout down with 53 seconds left to finish off the victory. “It gave me confidence, because I lost to him before,” Nestor said. “I just knew I needed to work a little harder to come out on top. Confidence will be needed. This is the most important part of the season, and there is still more work to do for the Bubblers senior. Nestor has never qualified for the state tournament. He took a big step Friday morning and will have to continue that effort against Middletown’s Nate Brady in the semis and moving forward.